The gang gathered for a group send-off at the airport Feb 18 at 6:30 a.m. Elizabeth set off with our best wishes for an amazing trip. February 22. Elizabeth has landed safely after a 36 hour journey via Vancouver, Frankfurt and Kampala. Here's her message: "Today was all day orientation which was very well done. Yesterday we went to a wildlife refuge which was very interesting. We got to pat a rhino! We also saw a cheetah, a leopard, an elephant, a few giraffes and a number of chimps. We had lunch at a restaurant overlooking Lake Victoria. The group is very interesting - very special to have representation from four countries." Delegates will not be able to post photos from Africa until the SLF gives them vetted shots, as the Foundation wants to ensure that projects and grandmothers are protected. As a result, we may need to wait a little longer to see what they are doing. February 24. 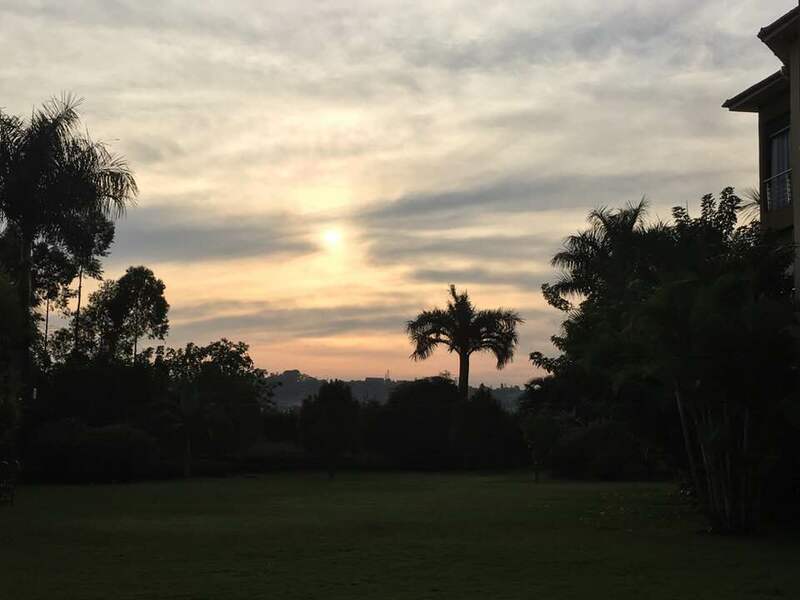 Here are some photos from Kampala, Uganda. Elizabeth is off now to Arusha, Ethiopia for the Tanzania Grandmothers Gathering. 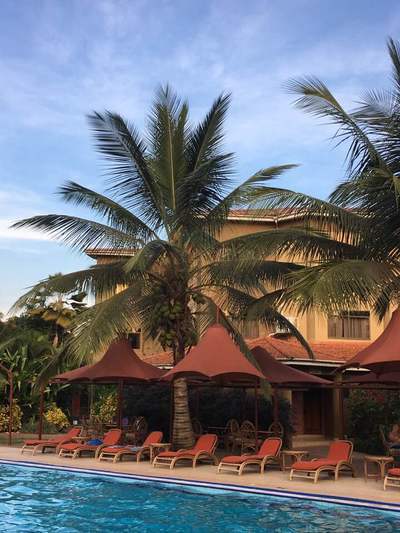 Her fellow delegate Gail Rappolt wrote on Facebook, "Leaving Kampala. We experienced such incredible compassion, resilience, courage and ingenuity. Flying to Arusha today. 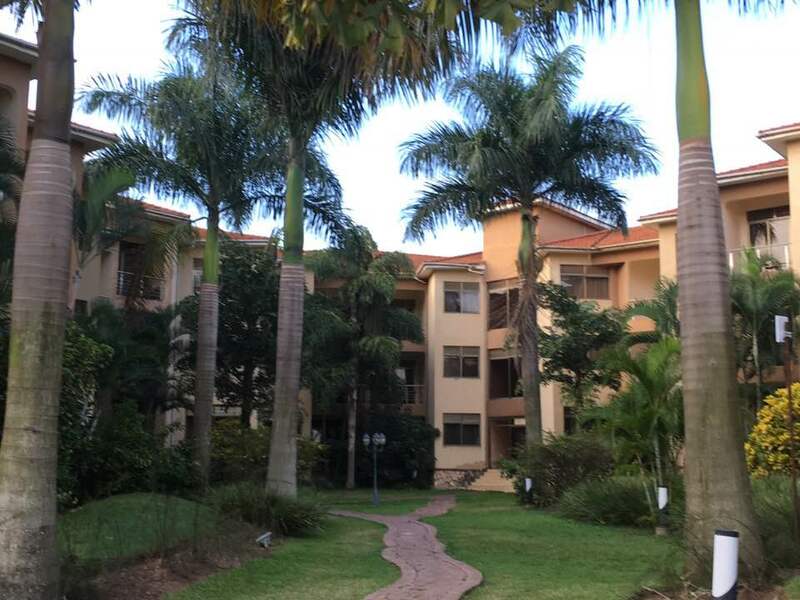 Leaving our lovely hotel in Kampala. Looking forward to the Tanzanian Gathering. ." Our time in Kampala and area was fascinating. One of the first things we had to do was to get to know each other. We had a day of orientation, and then were divided into two groups for two days of project visits. They were fascinating, but the descriptions and details will have to wait for another time. A number of the others had been to Africa before, but for those of us who had not, just being in the city was overwhelming. The traffic is bizarre and terrifying. There are thousands of boda bodas - motorcycles which are driven at alarming (to me) speeds. They pass on the right and the left. They cut in front of each other and any other vehicle. A lady passenger sits side saddle behind the driver. There are also thousands of bicycles in the mix too. Occasionally you see one being ridden as we see them at home, but more frequently they are used for transporting anything you can imagine. I think one of the strangest ones I saw seemed to be carrying a coffin! We were instructed to not take pictures out of the windows of the vans, as the reason could be misinterpreted. It can be thought that you will sell the picture and make money. I think one of the hardest things to deal with is the heat. I am feeling so fortunate to be here, and with this group. The staff have commented on what an easy, adaptable group we are to be with. Needless to say that pleases us greatly! I will tell you one tidbit from our last visit. It was photographed, but will not be in the official photographs as they rarely post photos of children. We were with a group of Grandmothers who had greeted us with hugs, songs and dances. One of the African Grandmothers slipped away for a few minutes and came back holding a baby. I went to her to see if it was all right to touch the baby - maybe to stroke her arm or her wee foot, but the Grandmother handed her to me to hold! She was a beautiful, mellow 4 month old. My family will understand what a highlight that was for me. I can hardly wait to see the photos! I had taken my glasses off, as they darken and don’t look nice in the photos. This dear baby reached up to my face and kind of patted the eye area. She did not poke me, but seemed fascinated. I assume she had never seen a white person, but the blue of my eyes seemed to be what she was interested in. February 25 . Photos from the first night of the Gathering -- see Elizabeth applauding? Here come the Grandmothers! Click to watch as the The Tanzania Grandmothers Gathering begins! March 7. After a gruelling 40 hour journey, Elizabeth landed safely last night and headed home for a well earned rest; hope she is still sleeping. In the days ahead we'll start to hear her stories. Don't miss our next General Meeting on Tuesday April 3 at 1:30 p.m. where she'll share the highlights and announce a date for a full presentation you can invite your friends to attend. 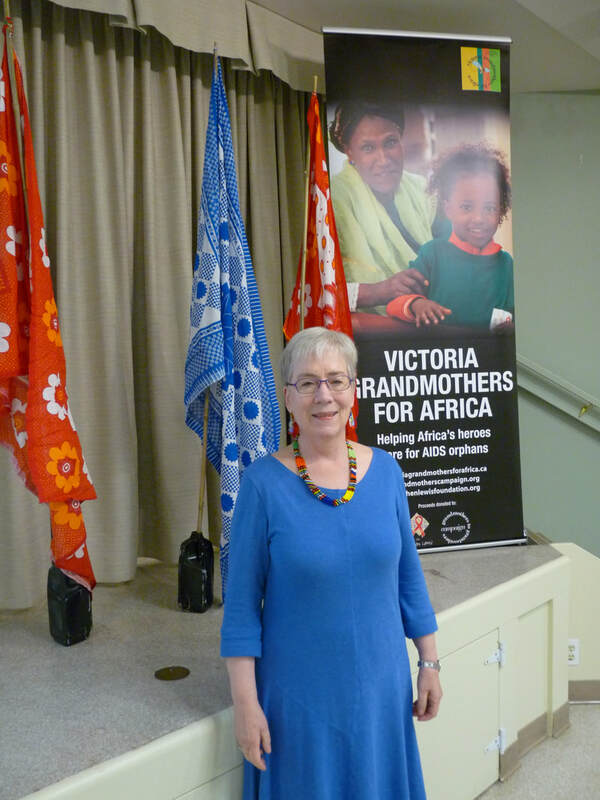 In February, 2018, 11 grandmothers from Canada, the United Kingdom, Australia and the United States, will represent the Grandmothers Campaign at the Tanzania Grandmothers Gathering in Arusha. 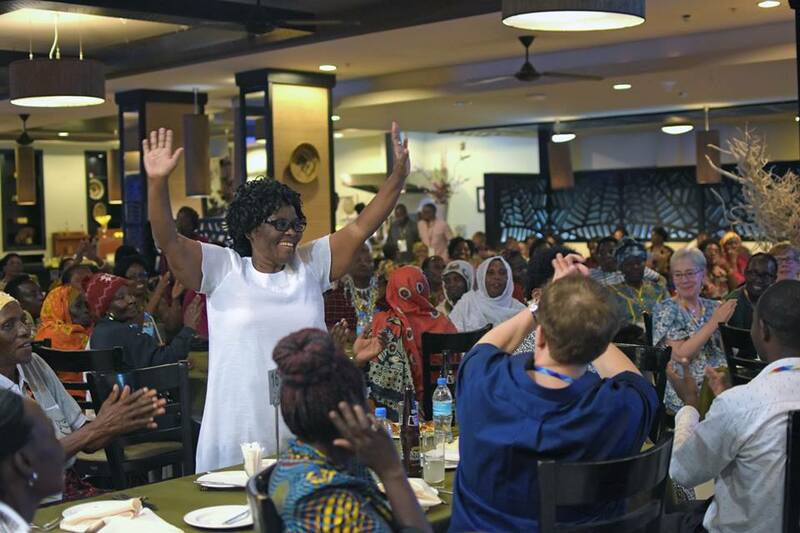 As delegates they’ll attend workshops and celebrations and spend time learning about the challenges and achievements of Tanzanian grandmothers and the dedicated community-based organizations that support them. Before the Gathering, they’ll make a stop in Kampala, Uganda to visit two of the SLF’s partner organizations and hear directly from the grandmothers there. When they return, they’ll have so much to share, including stories, photos and new insights into the lives and experiences of Tanzanian and Ugandan grandmothers! Each delegate has committed to one year of sharing what she learned with grandmothers groups, faith communities, schools, media and community organizations. We’re happy to connect you or your group with a returning delegate! Just email us at campaign@stephenlewisfoundation.org.